Leading in Context LLC has published its first eBook “Ethical Implications of How Leaders Perceive Different.” The eBook provides a talking context for businesses seeking to understand what it means to lead ethically and to incorporate ethical practices into daily leadership. How leaders perceive “different” ideas and people impacts leadership behavior and causes changes in organizational culture, employee engagement and the ability of a business to innovate and adapt. “Ethical Implications of How Leaders Perceive Different” is a nine-page eBook designed to enhance leadership development programs by providing a thinking context for ethical leadership. The context graphics depict a continuum of “Five Leader Perceptions of “Different” and “Resulting Leader Behaviors.” The materials are designed to be used to enhance current company leadership programs. The context graphics are compelling and will appeal to business leaders at all levels in organizations. Business Schools, Chief Learning Officers and External Consultants will find that the materials take the learning conversation about ethical leadership to a higher level. 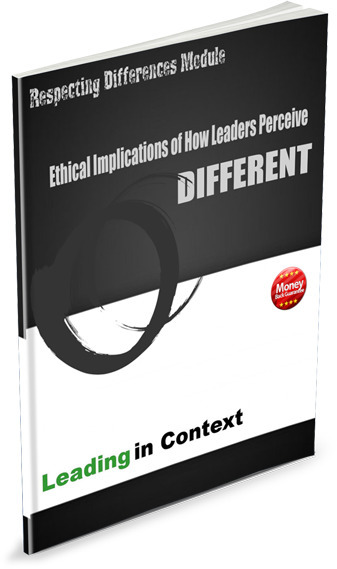 Note: Ethical Implications of How Leaders Perceive “Different” is no longer available in the Leading in Context® Store. Contact Info@LeadinginContext.com for Information.